She's back and causing jaws to drop as always! 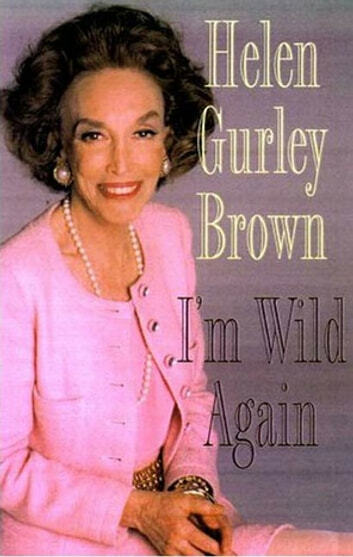 As bold and amusing as ever, Helen Gurley Brown, who made her mark in publishing history when she became editor in chief of Cosmopolitan in 1965, has written her first memoir, I'm Wild Again: Snippets from My Life and a Few Brazen Thoughts. While the subjects of her seven previous books have all been drawn from her own experiences, this is the first time Brown has concentrated on herself as the sole subject of a book and revealed the secrets of her sometimes shocking and always interesting life. In I'm Wild Again, Brown discusses several aspects of her life that she has not opened up about before. She talks about her breast implants and cosmetic surgery, her bout with breast cancer, her fidelity to her husband. Furthermore, she offers her thoughts on parents, adultery, office politics, exercise, food, marriage, affection...the list goes on. Never one to be shy or mince words, Brown doesn't leave any words unwritten, and the contents of her book "shocked, flabbergasted, amazed, irritated, amused" gossip columnist Liz Smith, who has seen almost everything. Larry King, Frank McCourt, Joan Rivers, Diane Sawyer, and Dominick Dunne have also praised the book and toasted Brown for leading such a courageous and vibrant life.